The Venue - Australian National Piano Award - The premier piano competition in Australia. The Riverlinks Eastbank Concert Hall seats 827 people, and also contains recital and function spaces, Alex Rigg Meeting Rooms and the Shepparton Art Museum. To book tickets and find out the sessions times, please contact Riverlinks on 03 5832 9511 or visit www.riverlinksvenues.com.au. Ticket price varies for students, adults and concessions, ranging from $30 - $10, depending on which concerts you attend. There is also a special week long package; we want to make this experience as affordable as possible so that everyone can enjoy the Award! Limited parking is available on Welsford Street and the main off-street parking is on the Goulburn River side of the Eastbank Centre, accessed from Marungi Street. The river-side or Marungi Street door is open for all performances and delivers patrons directly to the reception desk and Riverlinks Box Office. Wheelchair access is available only to Row A at Eastbank and space will be reserved wherever possible for those who require it. A hearing-aid induction loop is also available at Eastbank . 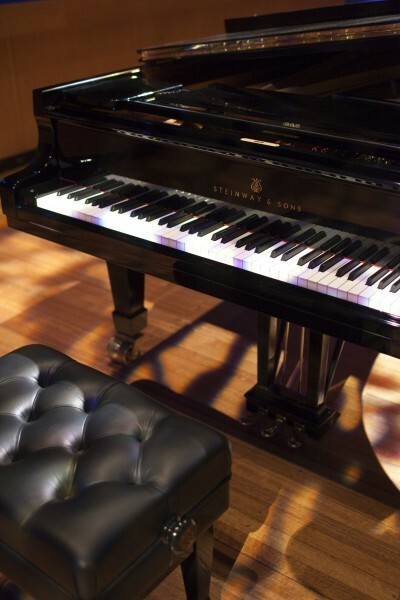 The nine-foot Steinway Concert Grand Piano on centre stage was purchased in 2004 by Greater Shepparton City Council, along with substantial donations from the local community, to bring world-class music to a regional city. A leading Australian pianist and a Steinway Technician travelled to Hamburg, Germany, together with a renowned German pianist, selecting this precious instrument. The Steinway Concert Grand Piano is prepared and tuned for the Australian National Piano Award by Mr Shaun Catchpole.